Black plum (jamun) is often avoided by many, because of its sharp and tangy taste. However, this fruit is known to have medicinal value and is a boon for diabetics. They contain an enzyme called “Jamboline”, which controls the blood sugar level and helps to manage diabetes. 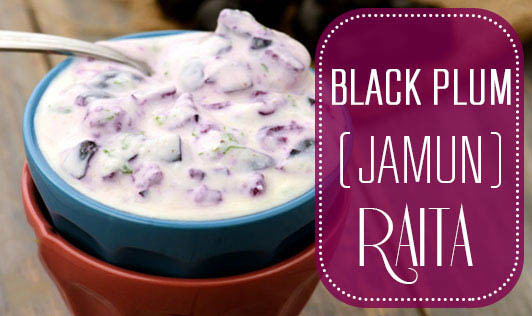 Jamun raita is a delicious dish made with low fat curd and jamun, enhanced with spices like cumin and coriander. Select soft, pulpy, ripe jamuns. You can serve the raita with pulao or use it as a dip with khakra or crackers. Whisk the curd using a whisker until it is smooth. Keep aside. Mix curd, jamuns, cumin, and chopped coriander in a bowl. Serve chilled with pulao or khakra.